Ok, ive just gone thru the ringer with gears. Hereâ€™s what Ive learned. Maybe it will save someone else a pile of time and money. There is a LOT of misinformation on the internet about gears. You really have to ignore it all. 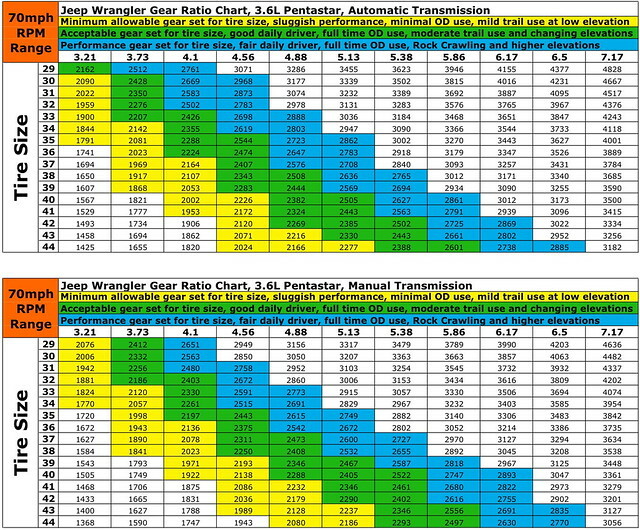 People use this chart to understand what gearing is correct, but I disagree with this chart on a few points. Mistake 1. You donâ€™t really know your tire size. I have 37x12.50R17s on Black Betty right? They are not 37 inches tall. I just EXTENSIVELY tested the calibration of my system because I couldnâ€™t figure out why I hated the new gearing so much. Turns out that my truck has to be calibrated as if its tires are 35.5 inches tall. And even there, it was off by about a mile vs. the gps for each 110 miles traveled. You need good distance to really test this, as you are talking about feet difference if your off by an inch. It takes a road trip to make sure its perfect. You rubicon owners who think you have 32sâ€¦ you have 31s. "No ones tires are the total height, everyone knows that, dummy." â€“ Yes I knew it too. But my brain figured that under load, the tire would bulge to the sides and top. So the circumference (length around the outside of a circle) of the tire, should be the same distance per revolution as a 37 inch tire would be. The way I figured it, the tire dosent wrinkle, you have to travel the full distance of the outside revolution and thus, even tho the tire measures 35.40 inches tall, all the bulged sections at the sides and top are still tread that has to pass for a revolution. Suffices to say. I was wrong. All the extra math I was doing means nothing. BB was only properly calibrated once I dialed her in with her tire size as the standard height. Straight from bottom to top. Totally over thought it. Mistake 1 â€“ selected gears based on my â€œimaginedâ€� tire size. LOL. When using that chart realize that your tire size is not the size you bought. Mistake 2 â€“ Chasing the crusing gear. With 4.10s, BB would cruise at 80 mph at 2500 rpm. Great right? I couldnâ€™t figure out why I was losing soooo much speed with the new gears. I was expecting the difference to be few hundred rpm. Well Im here to tell you, 400 RPM is a lot. But the bigger problem was that I was calibrated correctly after the gear change, and I WASNâ€™T before. So Im driving around thinking I have 37s on, calibrated for 37s, speedo responding like I had 37sâ€¦.with 35.5s on. Point is, I wasnâ€™t doing 80 at 2500 rpm. So the draw back I experienced was compounded with the realization that the speedo has been lying to me for 6 months. Not by a lot, but enough to shock me when the 4.88s went in. Keep in mind, Tires wear, and everyone runs at different PSI, My KM2s have about 4k miles on them, and im not sure how much I could have lost, but realize that we are talking about calibration, that relys on a rubber component that wears as you drive. So your gearing and speedo calibration is going to increase as the tires get smaller. You have to study your own truck to know where to start in order to use the charts correctly. Let me know if im overthinking again. Mistake 3 â€“ being afraid of the yellow section of the chart. â€“ Everything they say about the yellow section is negative. Minimum acceptable for daily driving. Maybe thatâ€™s true without the supercharger. (just realized thatâ€™s the xfactor here) but outside of that, the yellow section allows you to cruise at high speed on the highway. If you donâ€™t drive on the highway, fine. I donâ€™t do it a lot, but when I do, Its long distance. And having to hold the gas pedal down further to maintain 2500 rpm to do 70 mph is taxing. For rubicon owners, especially in the north east where highways move at 80mph, You have a 4 to 1 transfer case, so when you go into 4 low off road, your truck makes up for this Yellow level of gearing, So you have the option to have a higher cruise speed on the road, without really giving up anything off road. Ross from Ripp supercharger once warned me not to regear for this exact reason. I didnâ€™t listen to him and he was right. Mistake 4 â€“ reading forums. â€“ Yes, ill admit it. I was influenced by forums stating that 37s require 4.88s. Iâ€™ve realized that any idiot can open a forum account and blab about whatever they want. Valuable lesson, as a lot of my jeep knowledge comes from others and tons of research. When it comes to gears, ignore the forums. You have to buy them, and spend to install them before you ever find out if youâ€™ll like them. Its invasive and risky. A lot can go wrong. So before you take out 4.10s think long and hard about it. IF you have 3.21s and want to go to larger tiresâ€¦ Consider 4.10s or Yukon makes them as 4.11s They are the most expensive gear, but donâ€™t let that scare you. Doing this twice is far more expensive. Keep in mind, lots of people just repeat the garbage that others said without actually having that gear installed and lived with it. There is accurate information on the internet also, but for everything I read that gave the correct information I found 20 other posts that disagreed and gave bad information. Not everyone who talks like an authority is an authority. You need to check post count, and refrences. Mistake 5 â€“ Not realizing that manual trans is far different from auto for gearing requirements. Many of the people yapping online have autos. This makes a huge difference. Autos need new gear more than manuals. Because your pretty much on autopilot and at its mercy to select which gear to drive in. Your also confusing it with larger tires. People regear autos and it makes a big difference because the get better acceleration because they may be stuck in a higher gear as the cpu is deciding which gear is right. In a Manual trans, if 6th gear is your crusing gear, ignore it until you need it. If you need more torque, downshift. This higher level of control means that you can compensate for taller gears with your own brain, rather than change the gears. -	10% of the people who talk in forums are the ones giving out the info, the other 90% are the ones reading and commenting, but not being authorities. The way you become an authority is with experience. Normally these people will have large tires, and new gears, and metal flares, their rigs are crazy. They rock crawl moab, and rubicon trail etc. You know what is better for rock crawling? An automatic transmission. We were on the trail with RK and RIPP and about 50 rigs. There was one manual transmission there. Black Betty. Last edited by JeepLab; 04-13-2014 at 08:35 PM. I'm dreading making the gearing decision. I have the 3.6 engine, manual transmission, 3.21 gears and the smallest stock tires (29"?). I eventually plan to go up to 33x12.5x15 Duratracs. I'm happy with the way it drives stock, and 3.73s would get me slightly shorter overall gearing with the 33's (which are actually more like 32" or 32.5") than I have right now. I think I'm going to have to ignore all the typical forum comments about "if you're going to re-gear from 3.21, then at least go to 4.10, or else you'll regret it and re-gear again." We need snarf to weigh in, He just geared to 4.88 with 37s and no forced induction. Both my wife and I have 2014 JK unlimited rubis. Both equiped with autos trans. I have 4.10 she has 3.73 and honestly say I do not know which I prefer. We do quit of bit of highway driving on a daily basis 60-85 mph range. Thinking about it as i type I think I enjoy the 3.73 for highway driving and 4.10 for city driving. I too am considering a gear change for my rubi as I'm going with 3.5 inch lift and 34.5ish tires, and will also be adding forced induction to my build as well. I'm going with the wait and see method- do my mods drive around for a while and see if have to go down to 4.56. Do the gears last. The forced induction may change your opinion of what gears will be best. If you are staying under 35 inches for tires, I think you'd be nuts to alter them. Very interested on how the 4.56 work out for you. Post your finding for evaluation. Well, mine is an uneducated opinion, but seat of the pants feel and may not be all that useful. I recently changed my tires from 225/75-16's to 285/75-16's both running on the stock steel wheels and 3.73 gears. Can I tell there was a change, absolutely, plus the tires with 35 psi measure 31.75", I recalibrated with a procal and got the speedo within .6 mph. I have lost about 1.2 mpg, based upon the last 5 hour road trip that included a lot of slow hill driving on tight forest roads. The JK did great both on highway and offroad. Would 4.10's give me better acceleration, yes. Do I want to waste money on regearing for these tires no, especially since I plan in the long run to change out axle housings and gears in the future and putting on larger tires. But for now this is a DD and it isn't necessary to change them at this time. If I had 3.21 with 33" tires and wanted to change I would look for a set of 3.73's from someone who needed 4.10 or something smaller. Must say Jeep Lab great write up. I like the other forums, but have been finding myself coming here for a lot of information lately. 2013 Wrangler JKU - Rock Lobster Red, Smittybilt SRC rear bumper and side steps; RR drop in reusable air filter; Quadratec floor liners; 285/75-16 Falken Rockey Mountain ATSII, Rebel Offroad grab handles and fire extinguisher holder. Let's not discount the categorical colors in the chart. First, I'm speaking as a person with a naturally aspirated 3.6 Rubicon 6MT 2door. I recently added my lift and 37' KM2s and geared to 4.88. I also did a ton of research and chose 4.88s specifically for the improved gear ratio for crawling off road, even with my Rubicon T-case. The color charts above, even with at 36" actual tire size, put me at a low/middle mark in the "blue" or performance category. This is great to me and she drives better than stock around town when accelerating at in-town speeds, up to 60mph or there abouts. Point is, though I have the 4.88s, my vehicle's use is different from Ross' (e.g. 80mph highway) and I made the decision to gear at 4.88. Seems great for now, and I'm very happy. The most highway driving I'll do in Jesse's Girl will be about 2 hours to the off road park. I have a second 40mpg vehicle for the highway. The REAL test will be when I move to forced induction adding more power and torque. I see Ross' point being entirely probable in the prediction that when I have more power, the same 4.88 gears that made my jeep drive well with 37s, could actually serve to hold my jeep hostage to the new found power. If that is the case, then so be it and I'll have to make the change. Either way, I'll let everyone in Jeeplab know my opinion as objectively as possible!